The holidays are a busy time of year especially for parents. You plan special meals, wonderful gatherings of family and friends, and search for just the right gifts to delight your children. It's a lot of work and so it's interesting to consider what your children will remember a year from now. A mom told me that she was busily pondering the gifts she should buy for her two grade school children. Trying to find meaningful gifts, she decided to ask them what they could remember receiving last year for Christmas. Neither one could remember a single gift they received. Here she put so much time into finding just the right gifts and only a year later they don't even remember them! 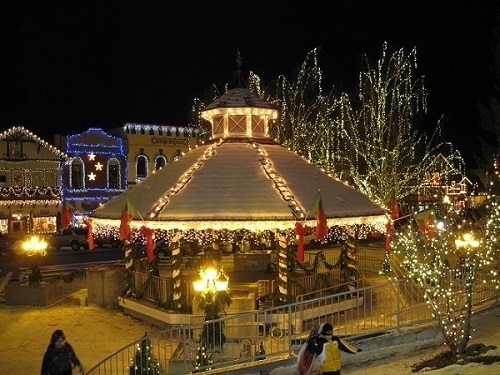 One of our holiday rituals is a trip with friends to the Bavarian themed town of Leavenworth. It is nestled in the beautiful Cascade Mountains so there is snow for sledding and cross country skiing. We have been going for over 20 years starting when our kids were young. Now that they are adults, they still return to join us. A family video from 1997 captures some of the magic of this place. From my childhood I remember going to church on Christmas Eve at midnight. It was a big deal to stay up so late. When we got home, we'd change into our pajamas and meet in the kitchen. We could eat as many Christmas cookies as we wanted - much to my delight! My Dad would open a bottle of Blackberry Manischewitz. It was a special treat to enjoy the sweet wine in the fancy glasses. What could possibly be better than Christmas? For me it was Christmas when my Grandma and Aunt travelled by train or bus from Grand Forks, North Dakota to join us in Minneapolis for the holidays. All the grandchildren loved being with Grandma. She was very interested in everything going on in our lives. She asked questions so she could hear about all the wonderful things that were happening for us. Grandma adored each of us just the way we were and that was a true gift. She was so much fun to be with - at the holidays or whenever! She liked playing games, knitting slippers, making cookies and creating pizza parties for us. She shared a one bedroom apartment at the top of an old house with my aunt. My parents, my two brothers and I stayed a number of days with her when we'd visit. Looking back, I wonder how spending a few days in a one bedroom apartment with one bathroom brought us so much joy. It was definitely Grandma's love that made it so special. My Grandma died many years ago and I often think of her. It might be when I'm snuggling under one of the quilts she made or knitting the same type of slippers she used to knit. Thoughts of her bring warm, happy feelings. One time I was buying my Mom's favorite sour cherry ball candy to send in her Christmas package. The lady who was checking me out told me I just needed to buy about five more balls and I'd get a free ornament. She was so enthused about this ornament that I agreed. Oops ... not quite enough. One more ... still not enough ... one more and then one more. Finally the bag weighed a pound and the ornament was mine! She handed me a fancy pewter ornament shaped like a snowflake. In the center on both sides is engraved "Granddaughters are a blessing". It certainly is nice but I don't have any grandchildren yet so I wondered what I would do with it. And then I remembered that I am a granddaughter; the granddaughter of a most remarkable Grandma. This ornament is a special reminder of my Grandma and the mystery and miracle of the holidays. It seems that the magic of the holidays are remembered primarily in the time we spend together with those we love. While the gifts are an important part, it's your family's holiday rituals that your children will remember the longest. May your family enjoy many warm and wonderful times together this holiday season!